My friend says I’m getting a grill because I’m getting dental implants. He says Lil’ Wayne has grills. I don’t think they’re the same thing. Who’s right? Normally, this would be a straightforward, easy answer. But, you added Lil’ Wayne into the equation which muddies the waters a bit. Lil’ Wayne has gone on the record saying they are not a grill. In fact, he said that he’s dying with them because changing them would require surgery. You can see the conversation in the video below. That would imply that he has dental implants. So why is that muddy? Because his dentist implied it’s a grill on his website. Though, since then, all articles he had on his site about Lil’ Wayne have been removed. So, either, his dentist wasn’t honest about what happened, Lil’ Wayne just didn’t like him using him to drum up business, or Lil’ Wayne has no idea which procedure he actually had. I do know whatever he did cost him over $150,000, which unless he’s wearing real diamonds, would make me think it’s implants. But, to answer your original question. A grill is removable and just goes over your teeth. Dental implants are surgically implanted and are permanent. In fact, they’re as strong as natural teeth. You can still get them decorated like a grill if you wanted to. It just increases the price for you. Also, unless you’re getting dental implants on all your teeth (which would be ridiculously expensive) make sure you whiten your teeth first. For whatever color your implant crowns are made is permanent. If you want white implants, you’ll want them to match white teeth. 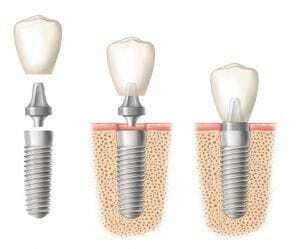 Are Dental Implants My Only Option for Broken Teeth? I’ve broken two teeth down to the gumline. I’m assuming I have to have dental implants to replace them, but the idea of being at the dentist’s that long terrifies me. Do I have any options? You have several options. The only one that is out is a crown because there isn’t enough tooth structure. Let’s start with your terror. Don’t feel alone or foolish. Lots of people are afraid of the dental chair. Something to consider is sedation dentistry. You won’t have to worry about pain. In fact, you’ll feel pretty good. It doesn’t knock you out, so you’re still in control of your faculties. Now, let’s talk about your options. First, dental implants. They are honestly, the best option. You’ll be the happiest with their functionality than any other option. You won’t spend any more time in the chair for that procedure than another, but it is more involved. Two other options for you is a dental bridge and a partial denture. Generally, with a dental bridge, you’d just have one false tooth suspended between the bridge crowns, but you can do two. The partial denture is something that will just attach to your other teeth, but not quite as securely as a bridge. I know you’re scared. Go to a dentist that regularly treats fearful patients. You’ll find more compassion and patience with them. Some search terms would be sedation dentist or cater to cowards dentist.